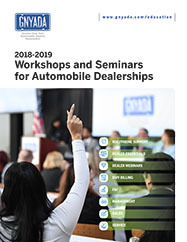 The Greater New York Automobile Dealers Association’s Education & Training Programs play a critical role in preparing dealership professionals for the competitive challenges of the automotive retail industry. Our programs train new and seasoned professionals to improve the efficiency and profitability of each dealership department. As you look through our educational offerings you will see that we’ve added plenty of new classes and updated many of our regular trainings to meet the challenges of doing business in today’s social marketplace and data-driven economy. All classes take place at The Center for Automotive Education & Training, located at 15-30 Petracca Place, Whitestone, NY 11357. If you have any questions about our training programs or would like to reserve your seat, call the GNYADA Education & Training team directly at 718.640.2012 or fax a registration form to 718.407.6970.